I am of great religious faith, but of really little faith lately in government and politics. Corruption abounds. Decisions befuddle me. I watched with great interest this week as the Supreme Court heard the case of Myriad Genetics, looking to obtain a patent on the BRCA1 and BRCA2 genes because their work was largely responsible for encoding these genes that drastically increase a woman’s risk of breast and ovarian cancer. BRCA has been in the news alot lately because of Angelina Jolie, and I hope her ordeal has served to increase awareness of genetic diseases and their potential consequences. 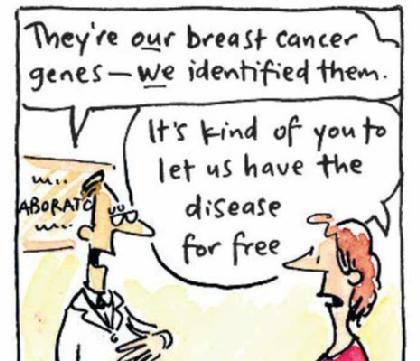 BRCA is not the gene affected in my family. In our house its PTEN, another gene that when mutated greatly increases the risk of breast, thyroid, uterine, kidney, skin, and other cancers. That however, is not the point. So many people missed that this case was even in the Supreme Court, and maybe I would have too – before PTEN entered our lives. 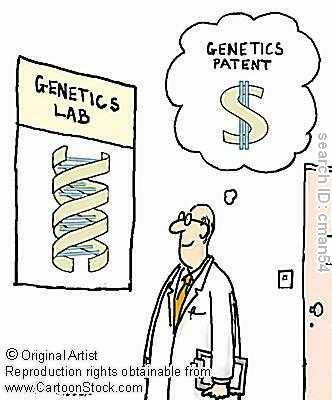 But, genetic mutation or not – the implication that a company could PATENT a human gene, and by doing so essentially block out research from any other company or individual is downright frightening to me. 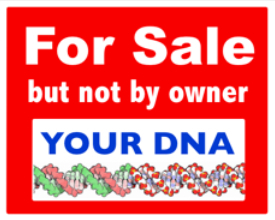 My body, my genes, my cells, or anything else a part of me do not belong to any company. My body is a gift to me from my Creator – plain and simple. I care for it the best way I know how. I seek out natural and medical cures where each is appropriate. Between my daughter and I we see about 15 doctors regularly. We weigh out their opinions, and we make our decisions. We replace them if they don’t meet our needs. This is a freedom that is inherent in this country. The thought that a company could patent the PTEN gene, and by doing so, essentially own the rights to a part of my body – AND , even worse restrict the already under-served research for this rare disease had me flat out outraged. I have already had breast cancer. I have already had a double mastectomy. I have already had a hysterectomy. I will be 40 in November. My daughter will be 10 in August and potential thyroid cancer looms large in front of our faces. She will one day have to face her own breast and uterine cancer risks. I can only pray that there will be some groundbreaking research before its her time. Thankfully – earlier this week I received an Email from my older sister moments after the Supreme Court handed down their UNANIMOUS decision, an excerpt of which is below. 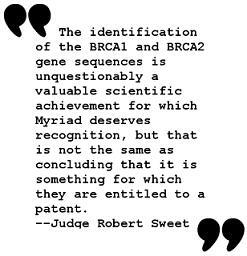 give Myriad the exclusive right to synthetically create BRCA cDNA. the Circuit found both isolated DNA and cDNA patent eligible. patent eligible because it is not naturally occurring. Pp. 10–18. I follow a group on Facebook for Young “Previvors,” a term used to indicate women dealing with genetic diagnosis that will greatly increase their risk of cancer. They give me hope with their strength, that one day when my own young “previvor” faces inevitable tough decisions, there will be young women around to support her. This link was taken from their Facebook group. I can sleep a little easier today, even as Paul Offit continues to swear that ALL vaccines are safe and effective, and we should NOT take our vitamins. And even as I get a little queasy about the protections issued to Monsanto and their genetically modified foods, I have to feel a little better. This week – the Supreme Court got it right.